Today, we’re excited to announce Enrichment, a new integration category on the Segment platform that helps you deliver a highly personalized experience with every customer interaction. 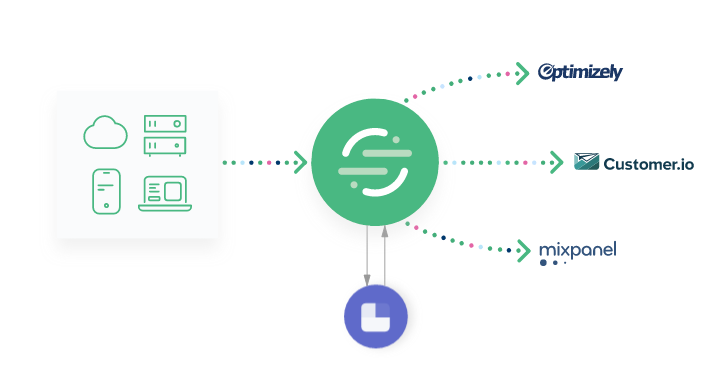 Our launch partner, Clearbit, has played a critical role in allowing us to scale 1:1 personalization at Segment, and we’re thrilled to have them on the platform. Traditionally, ensuring that the right content reaches the right audience, at the right time has been difficult to do. It’s hard to know who is interacting with your site, what problem they’re hoping to solve, and what messaging will ultimately nudge them to convert. By the time you’ve done this analysis after the fact, it’s already too late to craft a tailored message to win them back. Segment has made this process easier. As data from all of your Sources and to all of your Integrations flows through Segment, you are able to obtain an accurate view of the customer throughout their buying journey. With this information, you’re able to target specific customer segments based on certain events, or actions they’ve taken on your website. Or you might infer what to message based on high-level demographic data from Google Analytics, or most popular keywords searched. But what about a more precise approach that enhances your understanding of every individual customer and enables 1:1 personalization at scale? Enrichment makes it easier to personalize your customer experience by appending valuable data points to your data as it flows through Segment. As a result, you are able to obtain an enhanced customer profile and send it to hundreds of downstream tools — all in real time, for relevant personalization on the spot. Now with all of this enriched data in your CRM, your email tool, your analytics tool, and your data warehouse, you can take action when it counts. The result? More relevant marketing campaigns, deeper cohort analyses and insights, and more sales-qualified leads for top-line growth. With Clearbit, you can access publicly available attributes about a user’s company and history, like role, industry, and funding. With other enrichment tools, you might create a predictive lead score based on past customer behavior. All of this data is available through our partners and can be seamlessly added to your existing customer records. In the past, you’d have to ask customers to fill out surveys or multi-page signup forms to get at this type of context. The tradeoff sat between good UX design and data quality. Now, you can collect this third-party data automatically and create deeper connections with your customers without bothering them for more information. All you have to do is send data through Segment to an enrichment tool on the platform. They’ll send enriched identify calls back into Segment with additional user traits you can use in your other tools. Firmographic data and lead scores are just the beginning data sets for our Enrichment category. We imagine a world where you can enrich your data with weather data for better targeting, identify fraudulent charges, and more. All of this newly collected data can help you understand your customers in a way you’ve never been able to before. By layering company or lead score data on top of email opens, in-product behaviors, support tickets created, and more, you can analyze granular segments based on metrics like Customer Lifetime Value, Average Revenue per User, and NPS to identify who your best customers are. Companies like Breather, Trustpilot, and Livestorm are already using enrichment integrations to drive more targeted prospecting, more personalized marketing, more productive advertising spend, and more insightful cohort analysis. You can sign up to get started with Enrichment integrations. Do you have an enrichment tool you’d like to see on the platform? Are you a potential enrichment partner? We’re actively building out our enrichment partner ecosystem and would love to hear from you!